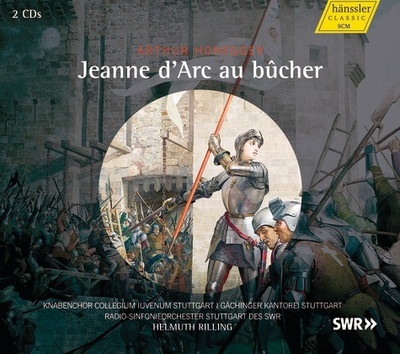 In the series of great oratorios that Helmuth Rilling has devoted his life to recording, such a seminal work like Arthur Honegger's dramatic oratorio "Jeanne d'Arc au bûcher", composed in 1935 is not missing. This 2011 recording shines with an outstanding team of both outstanding singers and choirs. They play a major role in the work's structure, commenting on the story and the experiences of Jeanne. The text comes from the French poet Paul Claudel. He and the composer were made for each other. They created a folk play, wherein the words and music stand equally side by side; the choir and rich colorful orchestrations are in perfect balance with the spoken word. It is always only a small step from medieval naivety to modern monumentalism, a step which Honegger makes masterfully and effectively.